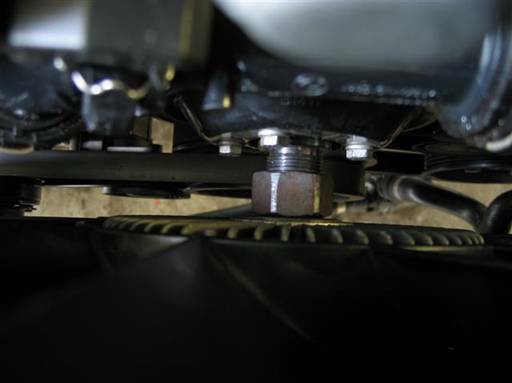 Note: Work under car can be performed without raising car, but will be under tight space. 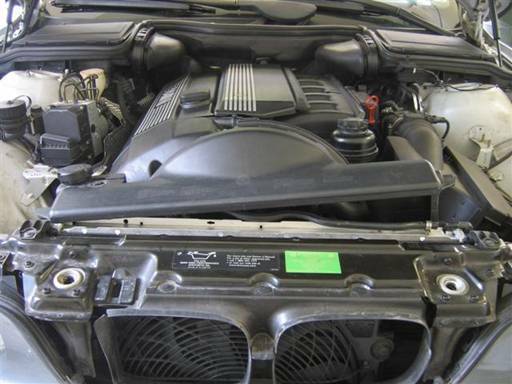 Remove large engine compartment shield underneath front of car (Philips). Disconnect coolant hoses from fan shroud bottom. Note hose mount sequence for reinstallation. 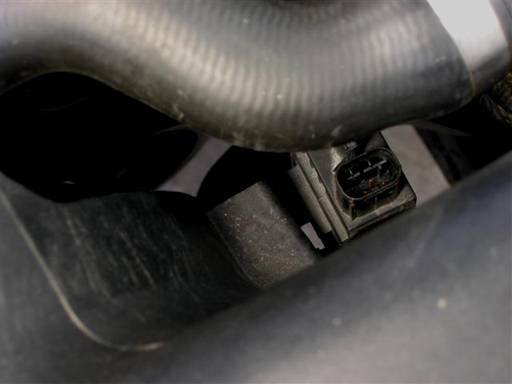 Disconnect auxiliary water pump electrical connector at bottom corner. Disconnect coolant hoses from fan shroud side. Slide pump out of fan shroud sleeve. Keep horizontal hose in shroud clip to allow pump to slide strait out. 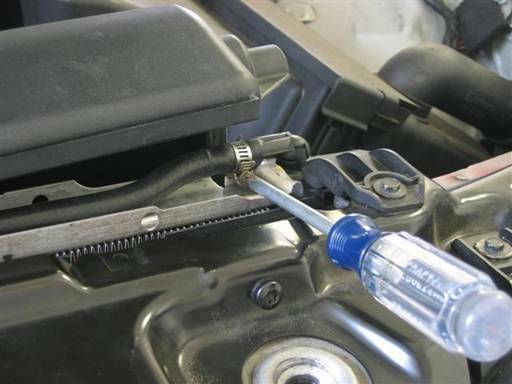 Once pump is out of shroud sleeve disconnect hose from shroud clip. 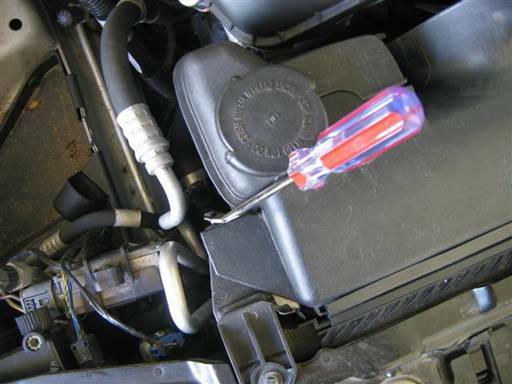 Note: Some coolant will leak from coolant hose connectors when manipulating them. Remove AUC (smell) sensor from fan shroud right side. Press in on electrical connector side clip and pull up electrical connector. Move electrical cable/connector to side. Push up on AUC bottom and pull top away from shroud. Push down on AUC top and pull bottom away from shroud. 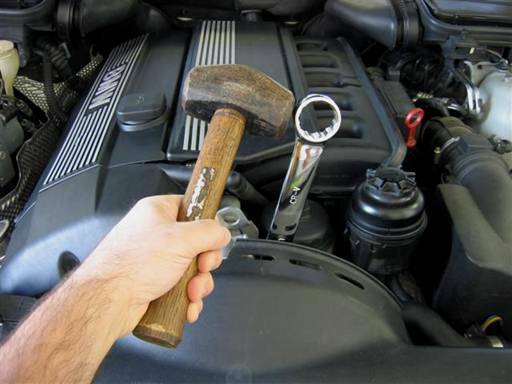 Remove AUC sensor from engine bay. Remove retaining plastic clip at expansion tank bleed crew. Press in at both wings and lift up (2 flatheads). 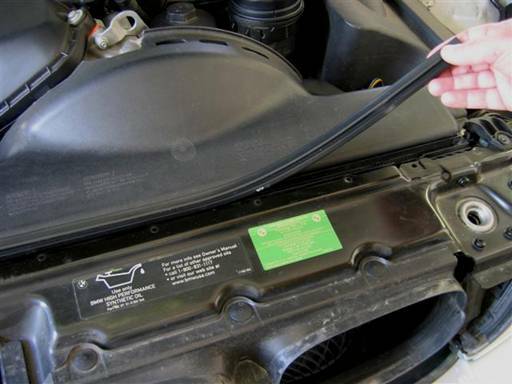 Remove rubber seal between fan shroud top and car frame (hand). Note seal orientation for reinstallation. Lift fan shroud up and to rear. Place fan shroud back into install position to facilitate space for fan removal. Lift fan shroud up, pull forward, and drop down to mount into lower frame slots. 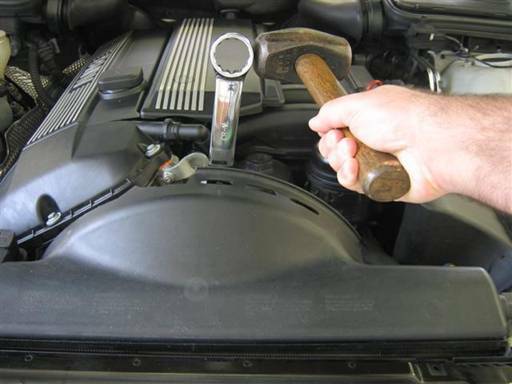 Remove expansion tank bleed screw, dislodge expansion tank from fan shroud, then reinstall bleed screw (Philips). 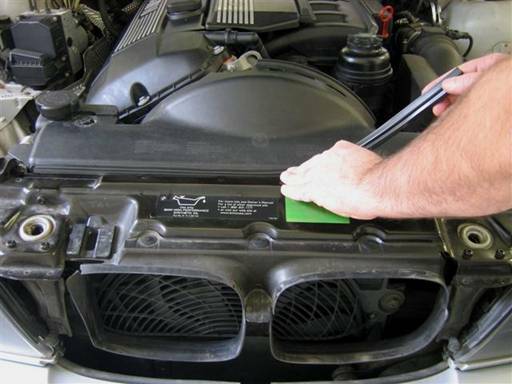 Pull up on fan shroud while removing expansion tank and hoses from shroud. Tilt fan shroud right side up to help removal. 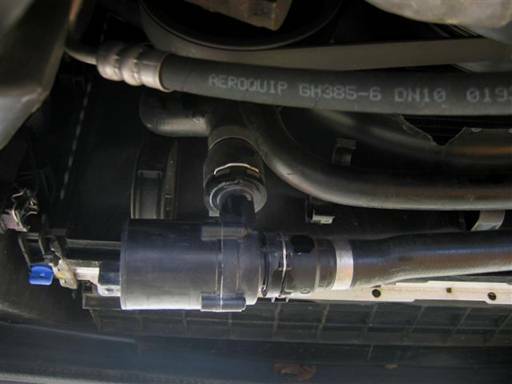 Pull out overflow hose from shroud access slot. 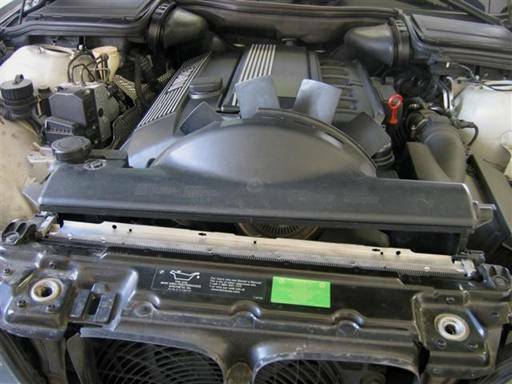 Remove shroud from engine bay. 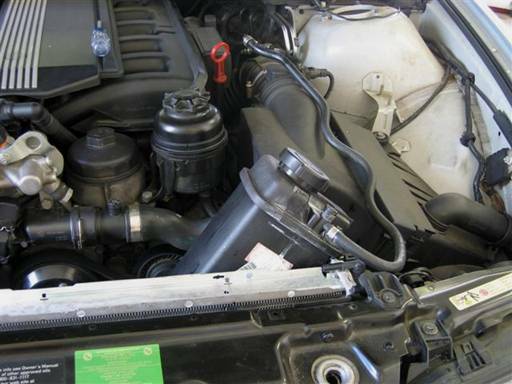 Place expansion tank at high location in engine bay. 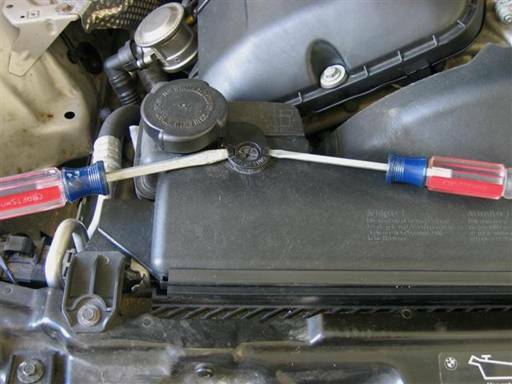 Place overflow hose high to keep coolant from draining out. 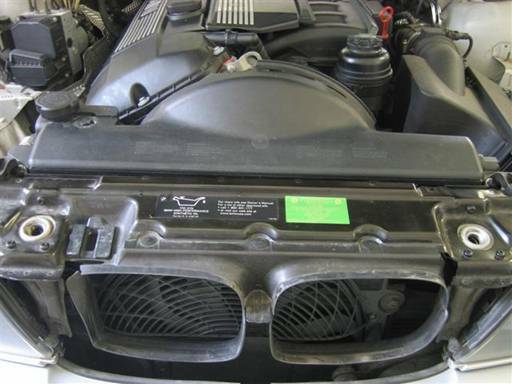 Note: Coolant will leak out from radiator overflow hose. 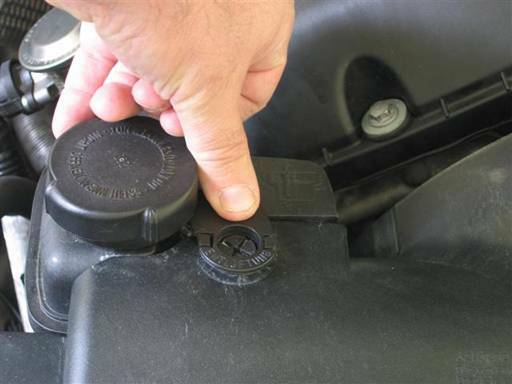 Keep expansion tank height low to minimize leakage. 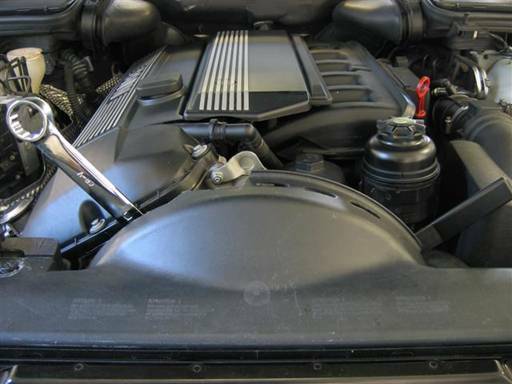 Position expansion tank at engine bay left side to mate with fan shroud. Tilt shroud right side up and slide shroud into position while attaching expansion tank to shroud. 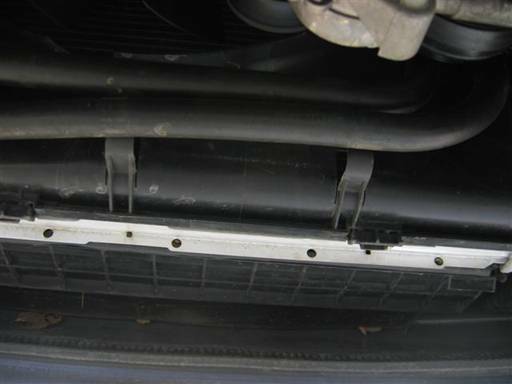 Insert expansion tank overflow hose into shroud access slot and lay on top of radiator. 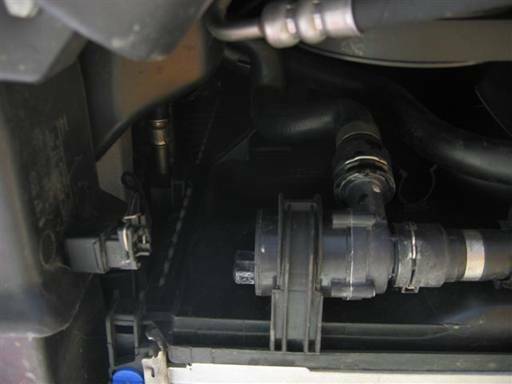 Remove expansion tank bleed screw (Philips), fully install expansion tank onto shroud, and reinstall bleed screw (Philips). Lift fan shroud up and to rear. 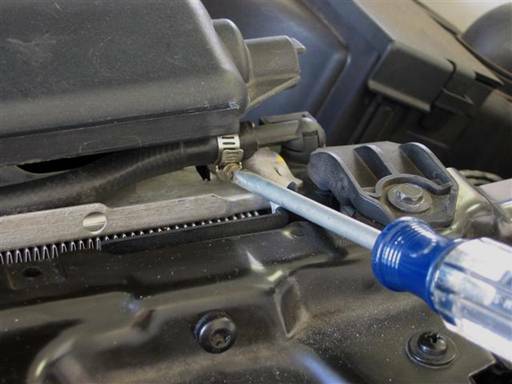 Insert overflow hose clamp onto overflow hose with clamp bolt head at bottom and facing forward (picture). 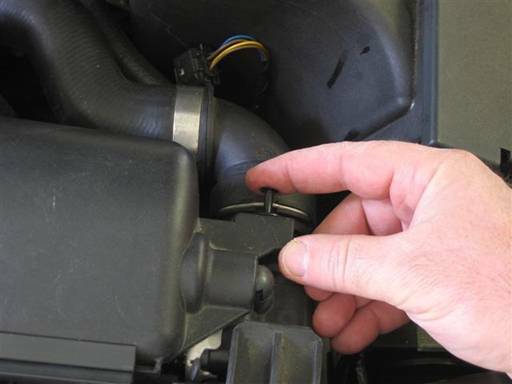 Mount overflow hose onto radiator overflow neck. Position hose clamp onto radiator overflow neck and tighten clamp (Philips). 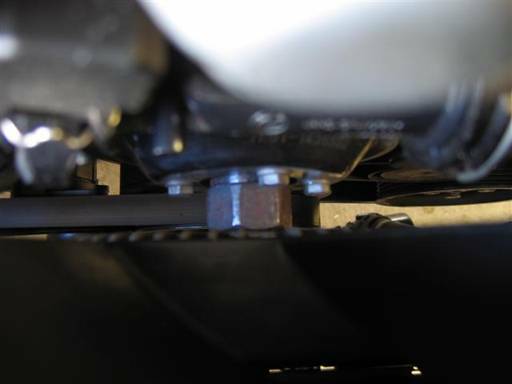 Note: Position clamp bolt at bottom of radiator neck to allow for proper fan shroud fitment. 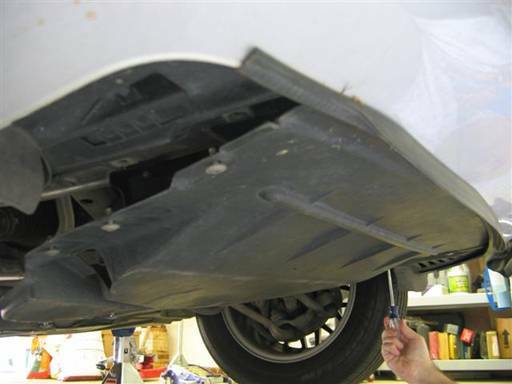 Install rubber seal between fan shroud top and car frame. Unscrew and re-screw expansion tank cap as needed to facilitate access. 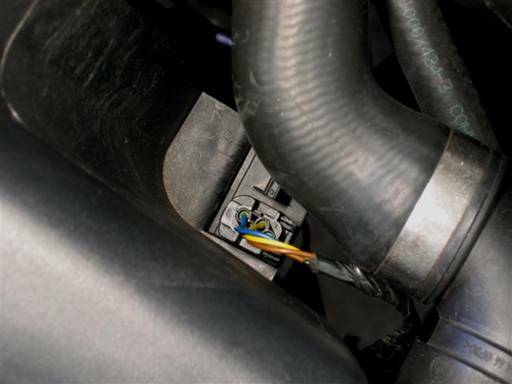 Install AUC (smell) sensor onto right side of fan shroud. Place sensor at mount position on shroud. Push down from sensor top and insert bottom clip, then push up from sensor bottom and insert top clip. 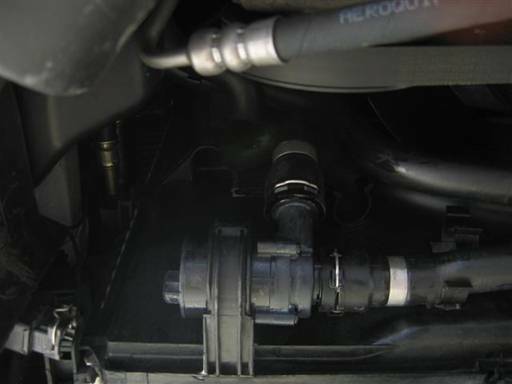 Insert auxiliary water pump into fan shroud sleeve at bottom left side. Insert horizontal hose in shroud clip to allow pump to slide strait in. 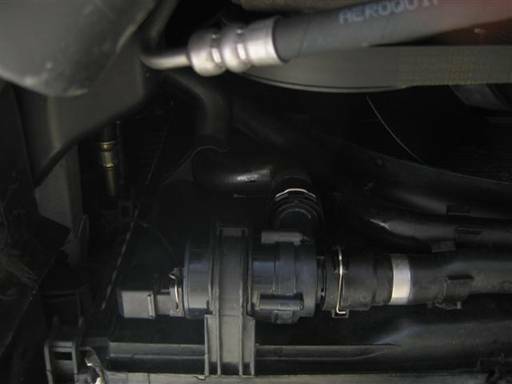 Install auxiliary water pump electrical connector. 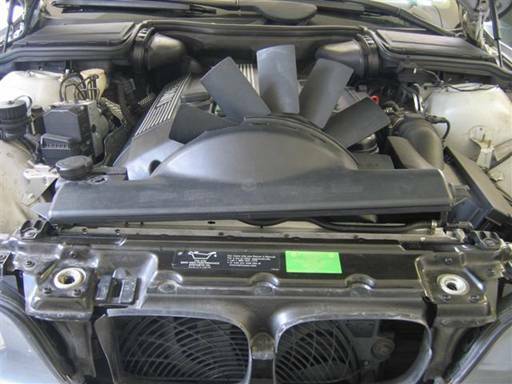 Install coolant hoses on fan shroud at left side. 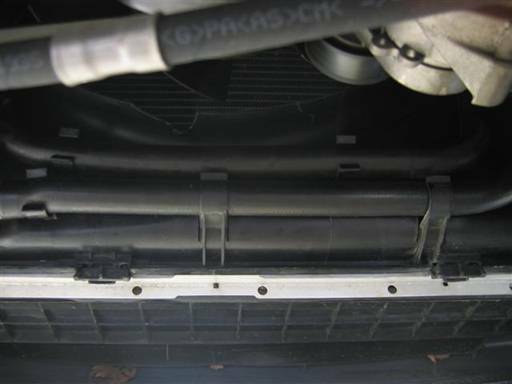 Install coolant hoses on fan shroud at bottom side. 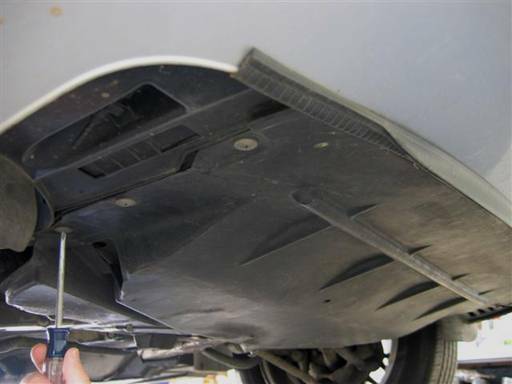 Install large engine compartment shield underneath front of car (Philips).